A crew of IRONMAN Foundation volunteers poses with their first finished deck! 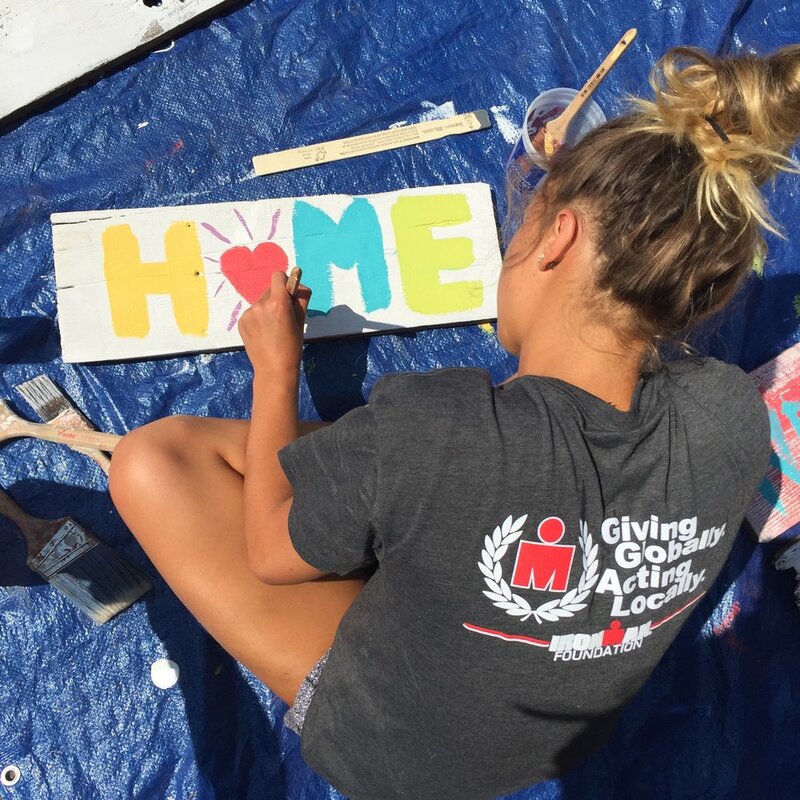 Sunday July 29, 70 Ironman Foundation volunteers converged at 180 Studios in Santa Rosa to build decks and “Welcome Home” signs for fire survivor cottages built by local fire recovery coalition Homes for Sonoma. This day of action was part of IRONMAN Foundation's dedication to helping race communities recover from disasters. Along with an amazing volunteer force, IRONMAN Foundation provided $30,000 in grants to support the day’s efforts. An hour before scheduled check-in, volunteers began to trickle into 180 Studios. IRONMAN Foundation Executive Director Sarah Hartman joked about athletic initiative while Rebuilding Together Staff mingled, sizing up our new rebuilders. During welcoming speeches, Sarah asked who there had participated in the 70.3 mile triathlon the day before and who had run the 5K earlier that morning. Hands shot up throughout the crowd. Volunteers were divided into teams, some creating “Welcome Home” signs and some building decks. Then they were off, sign makers and deck builders alike powering through the tasks at hand as if it were the final leg of their race. Sign builders had efficiently produced their pieces by lunch and had to be folded into deck production. Meanwhile, in a dramatic and unexpected setback, deck crews discovered that our fifteen year old drills were not up to the task of forcing screws into dense, composite decking. We reached out to our network and had 10 additional high-functioning drills by the end of lunch. New tools in hand, IRONMAN Foundation volunteers doubled down and were able to make their way through all 20 platforms (that’s 10 decks!) by the end of the work day. For volunteers and their families, this was the end of a long race weekend. For Homes for Sonoma and Rebuilding Together Petaluma, it represented a beginning. With houses arriving on our first site in early September, there are many workdays to come but Sunday was our first chance to put hands and sweat into recovery. Working hard to put screws in Trex decking. Young athlete taking care with her message. Decks built Sunday will dramatically expand the footprint of their small cottages, adding an additional 144 sq ft to the layout of the homes. They will be spaces for neighbors to gather for barbecues, families to spend evenings, and individuals to find solace in a book and their favorite chair. Signs in gardens, welcoming survivors to new homes, will say more than simple messages scrawled in paint. They’ll say that their community remembers and supports them. Rebuilding Together Petaluma was able to organize the build under the operations of a $400,000 grant from Albertson’s Foundation. After the fires of last October, we knew our experience with volunteer coordination uniquely qualified us to serve Sonoma County during rebuilding. The Albertson’s fund has allowed us to reach beyond our normal scope of work in Petaluma to support our broader community in recovery efforts. We teamed up with Homes for Sonoma early on. They are a volunteer led-effort working to design and build neighborhoods of compact cottages for fire-affected families and individuals in desperate need of affordable housing. Diverse partners made this event possible! IRONMAN Foundation for their $30,000 grant! All of the incredible IRONMAN volunteers! Ohana Construction Inc. for framing the decks! 180 Studios for renting us space at a discount! Healdsburg Lumber Co. for discounted lumber! Fairweather Inc for moving decks into storage! Project captains Lew Spengler and Lon Wiley! And to Firehouse Subs Public Safety Foundation, Hoka One One, and Clif Bars Inc for their sponsorship! This has truly been a team event!